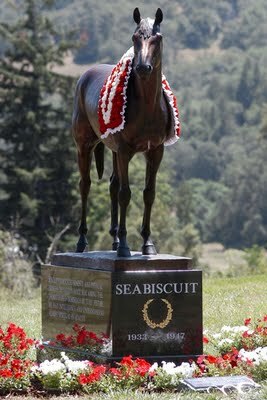 This is a statue of Seabiscuit - probably the truest champion of them all. From start to finish, this "little horse that could" showed us what it means to win - in life and on the track. What makes a champion is not really about how well someone plays a game - but most importantly, how they finish. The stamina, the drive, the focus, the dedication, determination and heart it takes to play their best through to the end defines the champion. To be in the running, we need daily preparation, paying attention to the basics and workouts in order to play well enough to qualify for that final competition. The champion knows all that work is required, relishes it, and loves the challenge of sticking with it to the very end, where ever that is. The rest fall to the wayside. This is true in our personal lives and work. You've seen partners who are champions - they're there for each other, nurturing their relationship to the end. You've seen championship teams - they're there for each other, nurturing each other and the team as a whole to the end. You've seen champions who choose the high road when everyone else caves to convention. The one thing that deprives a champion of accomplishment or accolade is not being in the company of other champions. Peyton Manning could not shine as the champion he is unless he surrounds himself with other champion players there to support one another in their quest to be the best. I've become very aware in order to excel as a true champion, to do all we can do and be all we can be, we need to work with and be with others who not only think, but act like champions as well. Who have a championship mentality. I find champions are great communicators, since it takes everyone in the game to pitch in and we all need to know what each other is doing. Champions are also planners - for the big picture as well as details; they can handle unforeseen problems because they've created alternatives. Plan B. Plan C. As many as it takes. Surprises and obstacles don't put them off their game, they maintain their focus and integrity through to the end. I pride myself on writing scripts that have very strong endings - where most fail. Champions are reliable. You never have to wonder whether they'll show up or if they'll show up half-hearted. They say what they do, they do what they say so everyone knows they can rely on one another on a championship team. Champions look out for one another; they have each others' backs. On days when one is more frail, champion teammates step in and step up until the hurting member is off the disabled list and back in full force. Champions are compassionate. They help other champions fulfill their promise. Champions are courageous. Facing huge hurdles daily, they experience obstacles as a challenge to be outfoxed rather than a debilitating blow. Champions are immensely resilient; they must withstand the slings and arrows of deceitful detractors. There are people who are so frustrated, who are unwilling to do the work it takes to be champions themselves, who dislike themselves so much that instead of working to discover their own worth, they spend all their time trying to sabotage and destroy people who are genuinely champions. Sadly, I've known a lot of people like this - some have changed over the years, others have only grown more bitter. Champions win the game of life. They make us better people - better at what we do and better stewards of our own lives and of those around us. Champions know that doing his or her level best day in and day out is its own reward. Champions know when to adjust, modify or change their game in order continue to excel. Athletes must change up their game - constantly learning how to play smarter, because their bodies change literally daily as they age. They know when it's time to leave the field a champion player and triumph as a coach. Champions don't cheat. They don't need to - they know that the moment they cheat, they are no longer champions. If there's a need to move on to another team, the champion handles the "divorce" with compassion, integrity and respect. Real champions are champions in every facet of their lives; they know fame is fleeting, fortune fickle. I love working with, being with, people who have a championship mentality. The trick is finding them. There are a lot of wannabe's, some of whom appear to be champions at first blush, but who only disappoint in the end. There are a lot of people who want to be with or around champions who turn out only to be sycophants or users because they don't want to do the work it takes to be a champion themselves, even when they have a blueprint of how to do it standing right in front of them. The way to identify the true champion? How they maintain the integrity of their work day in and day out; how they follow through; how they finish. Seabiscuit was also a jack of all trades-and master of them. He ended up bored with retirement, so became his owner's favorite cow pony! We should never "retire" from life!